"I recently spent three months teaching English as a volunteer in Luang Prabang. I was fortunate to spend some of this time at E4E. I believe the teaching system used at E4E is very effective, for students and teachers alike. It was great to be so welcomed and to become part of the E4E school community." 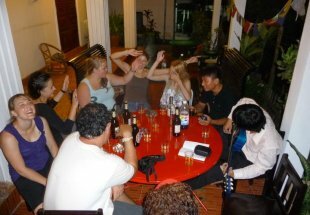 "In April 2010 I was a volunteer for six weeks in Luang Prabang, mainly at E4E. What I liked about the school in particular was the curriculum and the efficient way the school operated. Clearly, this was very different from common Lao schools. I fell in love with this school and the town and came back for a second time the same year and stayed for almost 3 months. Laos and its people will always be in my heart and I cherish the memories of the time I had there." "The thing that made me want to repeatedly volunteer at E4E was the systematic approach they take to learning. The overall beginner's course, and each individual lesson plan were well-designed. Each lesson built on the last lesson. Students gain knowledge and confidence slowly but surely, and as a volunteer, it was easy to see what was (or should have been) known, as well as what students have not been taught. I also liked the fact that in any given lesson, the role of the volunteer was clear. The explicit course structure made it easy for me to really help when volunteering downstairs in between classes. Whether I was engaging the students in open discussion or tutoring on specific questions, it was easy to assess what any given student knew, and then to focus the discussion or ad-hoc lesson to their level. I volunteered for 3 months in Laos, and gravitated to E4E right away. This meant I was able to sit in on classes at all stages in the program. I saw where students started when they first joined, and how much they could do when they were finishing the beginner's course. E4E is known for its success rate; the students really learn to speak, read, write and understand English. The classes include games and interactive activities, so they are interesting and engage everyone. The participative and interactive approach also makes it easy for the students in any given class to bond as a group and support each other. I loved being part of an effective initiative to improve both the teaching of English in Laos and the training of local teachers to be good English teachers." Last winter my husband and I took a 4 month sabbatical to travel S.E. Asia. We visited many beautiful places, but after a couple of months we grew tired of the tourist scene, and began searching for a more meaningful experience. We wanted to immerse ourselves more deeply into the culture, and get to know the Asian people on a more personal level. Through volunteering at English for Everyone we were able to achieve this goal. We met dozens of fun loving Laos people, as well as volunteers from other countries who were eager to share information about their country and their customs. The experience of getting to know these people, learning about their culture first hand, and sharing our knowledge was, by far, the most rewarding part of our trip. If you are looking for a "real" travel experience I highly recommend volunteering at English for Everyone! "I spent 7 months volunteering at E4E. When I first arrived, the 6 Lao teachers working at E4E at the time were half way through their training program. From the beginning I was impressed by the commitment and enthusiam shown, not only by Mr Claus but by all the Lao teachers. During the time I spent volunteering I was able to see the Lao teachers develop their teaching skills and confidence under the careful guidance of Mr Claus. At the same time, I volunteered in a number of different classes and saw students in their very first English class and also those that were a few days away from taking the end of course test. The students are keen to learn and practise their English with a 'falang' both in and out of the classroom. Some are a bit shy, but once they get to know you there's no stopping them! I was lucky enough to return to E4E again later for a couple of weeks and three things really stood out. The first was that a class I had volunteered in earlier in the year (from lesson 1) was now only a few weeks from completing the beginner course. The second was that a number of students that had been 'beginners' the last time I had seen them were now taking the intermediate classes run by Mr Marcel. The improvement in the students' English, at all levels, was wonderful to see (and hear). The final thing was the development of all the Lao teachers. They have all grown in confidence and have developed their own teaching styles. What really impressed me though was their dedication to continually improving their own English and how the obvious enjoyment they all get from teaching translates into dynamic lessons and enthusiastic students. E4E is not a big corporation just out to make money, its a small school dedicated to providing quality English classes to as many people as possible. There is no funding available from the government for the school and bills still have to be paid. The student sponsorship program at E4E means many people that could otherwise not afford lessons have the opportunity to learn and the teacher training program, run at no cost to the trainees, has so far given 6 Lao people a new career and a brighter future. I'm sure there will be many more in the future..."